I had a really difficult time listing this painting on eBay this week because it matches my kitchen. My husband's says I'll sell anything I've painted that isn't attached to the house. I'm really bad about not keeping anything for myself. 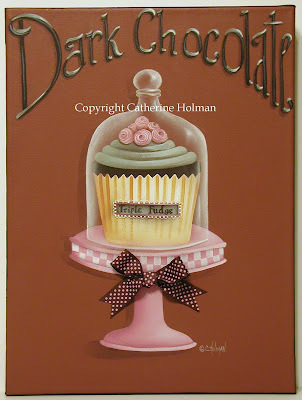 This is a much larger painting than my other cupcake paintings. It measures 12" x 16" and I even have the perfect spot for it. I may have to do another one of these for me! This triple fudge cupcake is made with dark chocolate and has a rich fudge texture. You'll want to sink your teeth into this beauty piled high with piped green mint frosting and topped with pink roses. 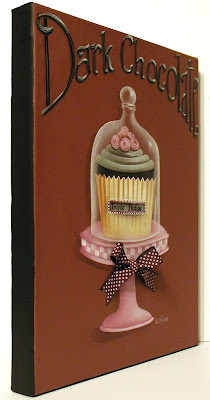 Displayed on a pink decorative cake plate and covered with a glass cloche, this cupcake will make your stomach growl each time you walk by it. A brown grosgrain ribbon with tiny pink dots is tied in a bow and attached to the cake plate. The black lettering at the top of the picture is dripping with green mint icing. These dreadful pink counter tops came with the house when we bought it, but this painting looks good with them. I painted my kitchen brown when we moved in because I thought it would make the counters look more like beige. I may have to give in and play up the pink because I have to live with them for a while. Your painting does look great in your kitchen! Are you kidding me? 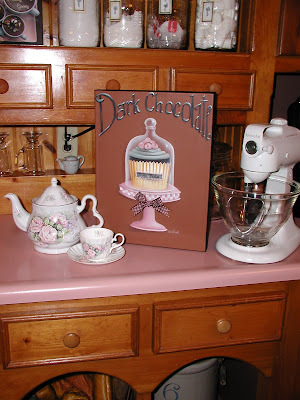 With your paintings you can so make pink countertops work!! Hi Catherine, love this cupcake. Every once in a while, I make something that I like so much I do keep it for myself. I figure I deserve it every now and again. This cupcake certainly does look lovely in your home. Love this one too! It does look good on your pink countertop! You do beautiful work! It's perfect in your kitchen and will inspire you to bake! heehee! Catherine, now you have made me hungry for a chocolate cupcake!! It looks wonderful, it does look great in your kitchen! Please don't sell that one! Or do get busy painting another similar one...that painting pulls everything together so beautifully! I like your pink countertops and, by using browns, you have made it unique and lovely. I don't think that I would give them up too easily. It's a very nice painting. That chocolate and mint thing has my mouth watering and some serious cravings happening. Your cabinets are so pretty. I'm wayyy not a pink girl, but I think you are good at making the countertops work. You have a very lovely home. It's gorgeous and looks fabulous in your kitchen, Cathie! Hi! I just found your blog through Sherri's Reading Jubilee. You are an amazingly talented woman! Your paintings are gorgeous! I checked out your items on ebay and I am so impressed!! You sound like you have reached such a peaceful, content place in your life. I'm anxious to read more of your blog. Nice to meet you!! Oh mercy, now I need to go find some chocolate, LOL!!! Are you going to do a print of this one? If so, I'm gonna have to get it, LOL! BTW, looks great with the pink countertops! Love this cupcake. Mmmmm, green mint icing! It really does look great on your countertop. My two favorites ... mint and chocolate - too deliciously cute for words! !